David McCarty is a photographer and lawyer with an eye for the ephemeral. 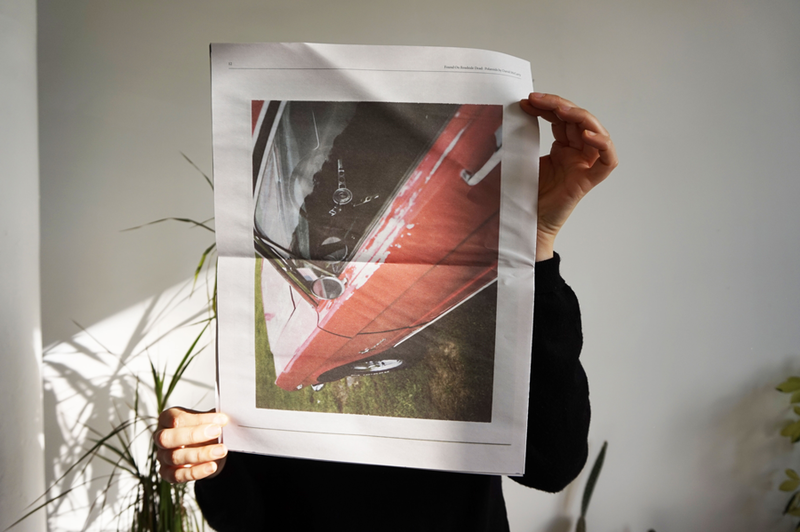 In his newsprint photobook, FOUND ON ROADSIDE DEAD, he combines two passions swiftly disappearing from sight: Polaroid film and classic cars. 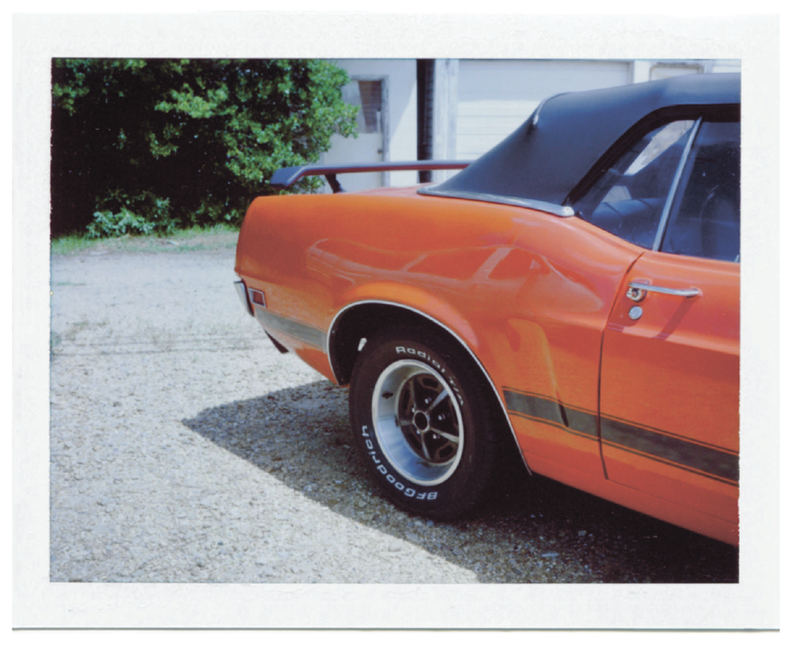 Born in Alabama and based in Jackson, Mississippi, McCarty inherited a love of cars from his family (who helped him buy a 1969 Camaro when he turned 16) and uses instant photography to "find pieces of my past and preserve them while I can, in the most beautiful way I know how." 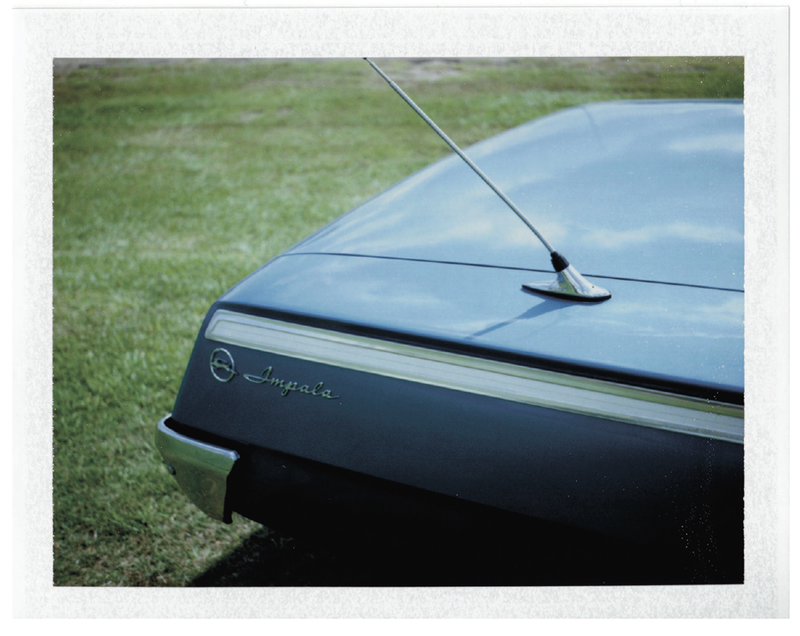 Chevrolet Impala, Ridgeland, Miss., Polaroid Land Camera. From FOUND ON ROADSIDE DEAD by David McCarty. 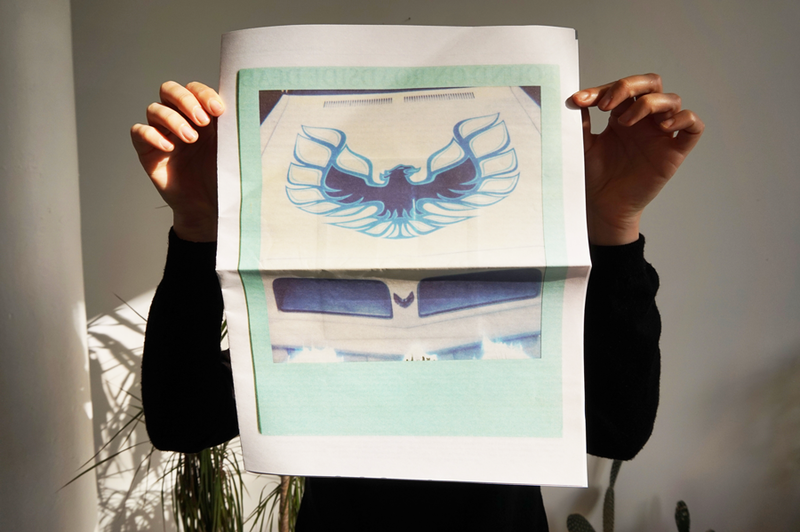 FOUND ON ROADSIDE DEAD is the second newspaper McCarty's made using our layout tool, ARTHR. 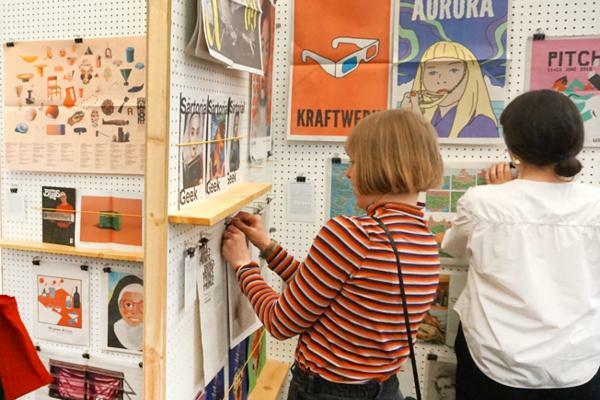 Coming from a hands-on DIY background, collaging his own fliers and tirelessly hand-stapling zines, he was wary of creating a newspaper digitally. But, he tells us, the experience was intuitive and the end result maintains a real-world fragility that complements his images. "It will all fade away," he says, "but it will look beautiful while it is here with us." We talked to McCarty about his love of Polaroid cameras (the only cameras he uses) and how he moved from making zines with a typewriter and gluestick to using ARTHR. I started using Polaroid film not long after the turn of the century. Even though it was relatively pricey – ten dollars for ten shots – it was readily available at just about any drugstore. Instant photographs were omnipresent growing up in Alabama, but I had never considered them as art – they were always for fun. The ones we had were always family shots, Christmas morning, vacations in the Smoky Mountains in Tennessee, beach shots in Florida. They were casual and soft. I do not recall a particular decision to start using Polaroid as a medium, and began slowly by using them in collages, sometimes adding a caption at the bottom. I had a boxy-type Polaroid that shot integral film, and then a friend gave me a Land Camera, which looked like this beautiful time traveler from the past, with its extended bellows and elaborate sleight-of-hand pack film. I love that there was a picture – right there, in your hands – almost instantaneously. I loved that it looked like you just pulled a slice of the world right out by pressing a button. And I loved the physical preciousness of Polaroids, creating a little piece of art where there was nothing before. 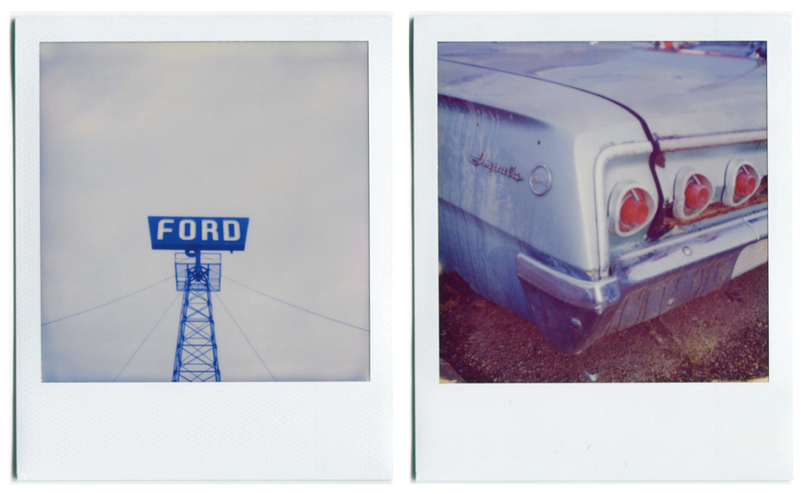 Ford dealership, Houston, Texas; Chevy Impala, Jackson, Miss., both SX-70. From FOUND ON ROADSIDE DEAD by David McCarty. But isn't Polaroid all gone? Then one day, there was no more film. It wasn’t at the corner drugstore anymore, no more dusty packs hanging in a grocery store, none even at the one remaining camera store in Jackson, Mississippi, where I live. It was just gone. There is a great documentary called Time Zero about that moment when Polaroid went bankrupt, and they sold through the existing stock of film. One of the artists in the movie cries when talking about how the film was gone, and when I saw that it rattled me, because I hadn’t realized how deeply it had affected me. I felt bereft. It was like if you were a painter and there were suddenly no more paint. You just couldn’t create any more. Ford Mustang, Ridgeland, Miss., Land Camera. From FOUND ON ROADSIDE DEAD by David McCarty. A valiant effort was made to recreate Polaroid through the Impossible Project. But something was different. The vivid, precise, light-safe colors of the old film was gone. In its place was this volatile, dreamy, often lovely but sometimes unresponsive new film. Like if you dipped a brush in the color blue, but it spread on canvas as red and then yellow and faded to orange. You never knew what was going to happen. Over time, Impossible refined their techniques, and the film calmed down. It’s still chaotic, and has made all of us shooting instant film a little wild. What are you shooting them with? For a good stretch my three core cameras were a Polaroid SX-70, a Polaroid 600 with flash, and a modified Polaroid Land Camera 250. With the recent end to Fuji’s production of instant pack film, I am just carrying the SX-70 and the 600. I use color & black and white films by Impossible now. 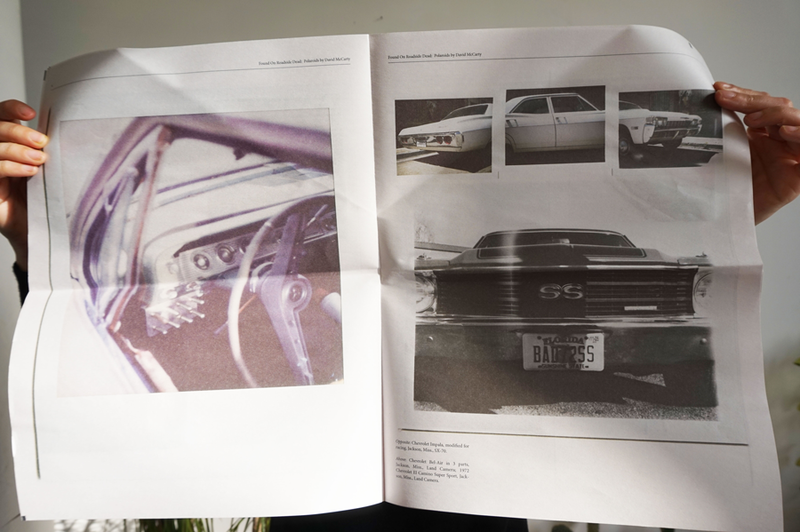 FOUND ON ROADSIDE DEAD, a newsprint photobook by David McCarty. 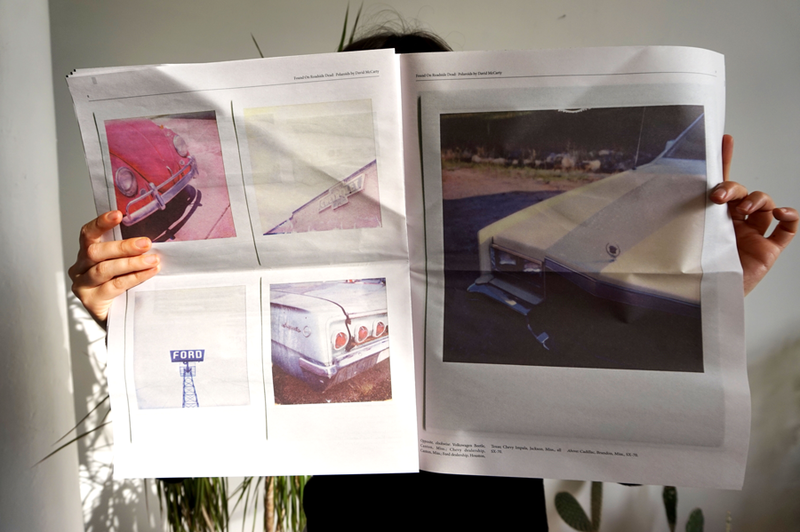 Why did you make a newspaper about classic cars? Those beautiful old chunks of steel are one of my favorite subjects, but as time passes they grow rarer and rarer. I’ve spent years stopping on the side of the road to take photographs of tailfins and chrome bumpers all across the South. I wanted to celebrate some of my favorite cars and photographs, and write down why these cars are so important to me. 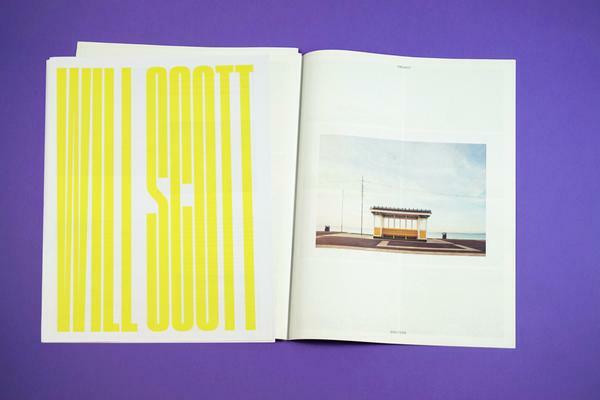 Last year a friend posted on Instagram that she had a new zine. I was stunned – it was a giant newspaper, filled with color shots of a trip to the desert, complete with captions. I immediately had to learn more about it. I loved the physicality of the form, the way it smelled, how beautiful the colors looked, the way it was perfectly folded. A few months later I was part of a group show of Southern photographers, and we used Newspaper Club to create a catalogue for our show, which we called Best Before in reference to the expiration date of Polaroid film. The rectangles of instant film and the softness of the newsprint fit perfectly. I was also in love with the idea that these little photos, which could fade and disappear completely one day, were perfectly represented within the relative fragility of newsprint. I knew for months I wanted to use Newspaper Club again for a Polaroid project, which became FOUND ON ROADSIDE DEAD. To just click a couple of buttons in Mississippi and a few days later have a box of newspapers is nothing short of amazing. How do you mock up your newspapers? Since 1993, when I was a freshman in college, the main way I created art was through hand-drawn or collaged fliers for bands. I stood in front of giant copiers for many happy years running off fliers, and combed through thrift stores and garage sales for old books for scavenged images. Over time, I began making zines, often with hand-colored or handmade covers, with text from an ancient Smith-Corona typewriter. The process of copying, collating, and stapling hundreds of pages was more exhausting than fun, but I was always amazed when it just seemed like a little book popped into the world after all that work. After I learned about Newspaper Club, the only thing that made me a little nervous was that I don’t know how to do graphic design on a computer. I’m fine with my typewriter, a gluestick, and a razor, but the complexities of computer design programs have baffled me. Then I saw the ARTHR program, and quickly realized I could easily move around photographs and that the text would even wrap into place! I was overjoyed. I used ARTHR for both Best Before and FOUND ON ROADSIDE DEAD. It’s a very intuitive tool, and perfect for zines that are heavy on photographs. My favorite part is that it will “click” the images up or down a size very easily. It made collaging in Polaroids for the newspaper very easy, and let me move around the elements to see how they might look best. The core design for FOUND ON ROADSIDE DEAD was done in just a few hours over two days. Any tips for ARTHR users? My background in handcrafting zines for years helps a lot in ARTHR. One of the things that is hard to plan for is the size. I think if you are making a newspaper for the first time it is worth creating a physical mock up, folds and all. You can block out text and decide what piece goes where. Recall that while ARTHR is a very flexible tool, it will work best if you have an idea of what you are creating. While arranging all the pieces in ARTHR only took a couple of days, I already had pre-selected what Polaroids would be included and knew there would be minimal text. Doing a lot of planning on the front end will cut down on frustration and work towards finishing the project. I also have another newspaper project in the works that will hopefully come out in 2017, tentatively titled “Ce produit est discontinué,” after the labeling on the last batches of Polaroid film. The expired Polaroids are a hazy orange and yellow, which I think will look good on the newsprint. Keep up with David McCarty's work on Instagram and Tumblr. Try our free layout tool, ARTHR. 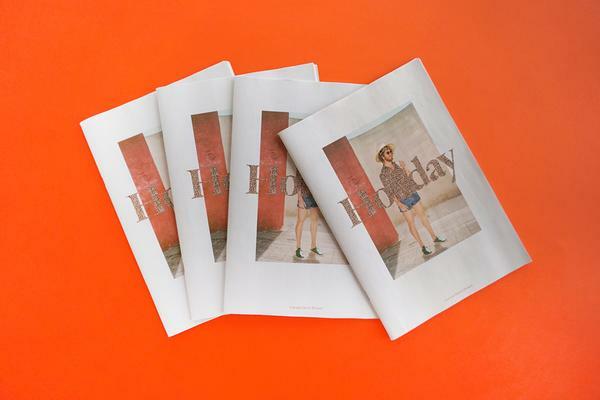 It's the simplest way to create a newspaper – no software or design experience needed.